I've blogged about what are the MUST-TRY GOOD FOOD in Melaka last year, how about one of the MUST-DO in Malaka for a change? Nyonya Memoirs, a fateful tale of a young couple unfolds as a wealthy Nyonya, Bao Zhu, accepts the proposal from the love of her life, Zhang Min - a poor, common Baba. Their engagement soon turns bitter when Bao Zhu's powerful and prominent family forbids the union. Divided by their social differences and driven to the deepest depths of heartache, can the true love between Bao Zhu and Zhang Min rise above to conquer all? Before you enter the actual theatre set, you would find yourself walking along this familiar street at the historical Melaka. Along the street, it features various setting that resembles Melaka itself. You would be surprised on how well-detailed all of them are made here. A lovely lady to greet all of you! Just so, you know that the tale of Nyonya Memoirs is exclusively brought to you by Hatten Group. It features a revolutionary new concept and a star-studded cast which explores Melaka's iconic Peranakan heritage through a fully-interactive live environmental theatre production. Upon entering the actual theatre set, you would see REAL human are everywhere and it also felt like you're entering another era, talking about time travel heh! 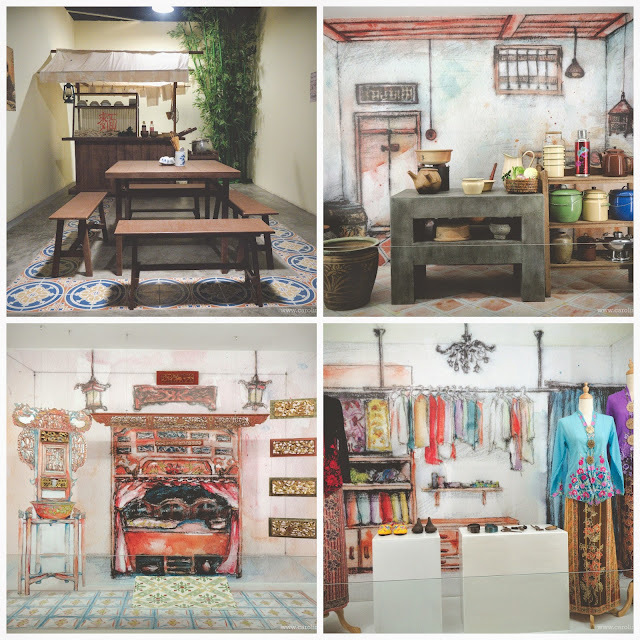 The Nyonya Memoirs set stretches across 600 meters on Level 3, from Dataran Pahlawan Melaka Megamall to Terminal Pahlawan and is designed in the life-sized architectural style of old town Melaka where the story of a young couple unfolds. It's like Melaka town inside the mall in Melaka itself, Melaka-ception it is! There are few different shops inside the set itself. Just like this particular shop, all the things that are placed here were all super nostalgic, especially when you see the old packaging of the items in this shop! It's really make everything so Instagram-worthy! Tailor shop where you can get your BabaNyonya costume done here! I really love the shoes here! You can even stop by for healthy herb drink! or maybe, some old-school candies? He is really an amazing narrator here! As I mentioned earlier, it is a fully-interactive live environmental theatre production. This innovative new concept makes the audience part of the production by moving them with the characters from scene-to-scene, thereby unraveling a culturally informative 'real-life' walk down memory lane. I personally find it really interesting and boy, it was super interactive that you find yourself to be part of the show without you realize it! Zhang Min bought a lovely pair of shoe for his lover, Bao Zhu. I'm trying not to give a detailed storyline because it's ONLY fun when you experience it yourself! Seriously, come on people, it's not only a one-of-a-kind compare to other theatre show, but also the first-of-its-kind here in Malaysia! If you enjoy and love musical like me, you'd really enjoy this one too! All the cast are not only required to memorize their scripts and act, but also sing and dance. Here come Bao Zhu's aunt and uncle. Beware, they are the bad guys! Because he knew they're just going to make it worst! Most of the scenes will be at Bao Zhu's family house. Her family house is big and consists of 4 main parts - living room, courtyard, dining room and her bedroom. I really love this scene very much! This is where they all get together for family dinner. Unhappy scenes continue with Bao Zhu's mother lecturing her; her father couldn't even help her; resulted in her to be locked in her room and not able to go out anywhere without her mother's permission. Here's where the plot twist! It will be depending on YOU as audience how much you would want to help Bao Zhu and Zhang Min to successfully reunited! That being said, the cast would run to you and asking for you help! Happy ending also means a grand wedding ceremony for you to attend! If you ask me, the entire show was very entertaining and it's good to learn another culture in Malaysia too! They speak Mandarin and Peranakan language, representing Melaka culture and dialect of their own. EARLY BIRD OFFER: Nyonya Memoirs tickets at just RM66+ only, for a limited time only! For more information or to book your tickets, please log on to www.nyonyamemoirs.com or visit the Nyonya Memoirs Ticketing Counter at Level 3, Dataran Pahlawan Megamall. For further inquiries, please call the hotline at +6018 663 9696.